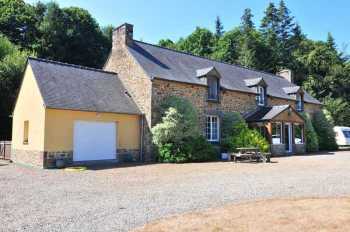 This impressive detached stone house is near the Brittany/Normandy border and sits in a quiet rural area. The spacious accommodation is well appointed and offers character features, exposed beams and stone walls, with all the convenience of modern living. For convenience there is a ground floor bedroom with en-suite shower room. A house that ticks all the boxes! The caretaker's accommodation is situated a little away from the main house to ensure complete privacy. The wide turning circle separates the main house from the large internal stables, barns and workshops. The lake is stocked and offers a very attractive aspect to the front of the house. Viewing is highly recommended. The closest village is about 2 km from the property with Bar/Restaurant and Bakery, but everyday amenities are found at Dol-de-Bretagne which is 8 km from the property from where you can join the motorway or take the TGV train to Paris in 2 hours 15 minutes. The property is 8 km from the Domaine Les Ormes with leisure facilities including an Equestrian Centre, Golf Course and Holiday Park. The property is about 24 km from the UNESCO heritage site Mont St Michel and is well served by airports at Rennes (55 km) and Dinard (39 km). There are regular ferry services from Saint-Malo (35 km away). Porch 3.66 x 1.95m Half glazed with door to front elevation. Tiled floor. Exposed stone wall. Entrance Hall 3.68 x 2.79m Partly glazed door to front elevation. Tiled floor. Radiator. Stairs to first floor. Telephone socket. Lounge 6.71 x 6.00m Exposed stone wall. Tiled floor. Granite fireplace with wood-burner. 2 radiators. Exposed beams. Window to rear and west and window and partly glazed door to south and conservatory. Conservatory 6.24 x 3.84m 2 skylights. Half glazed sliding patio doors to gravel terrace area. 2 convector heaters. Laminate flooring. En-Suite Shower Room 1.91 x 1.91m Tiled walls and floor. Pedestal basin. Heated towel rail. Convector eater. Extractor. Shower. Cloakroom Tiled floor. WC. Radiator. Extractor. Hand basin. Kitchen/Dining Room 5.97 x 4.78m Tiled floor. Window to rear and glazed double doors to south elevations. Central heating thermostat. Central island with granite worktops and end display unit and wine rack shelves. 2 radiators. Range of matching base and wall units. Built-in dishwasher. Double stainless steel sink unit with mixer tap. Display shelves. 4 ring gas hob with extractor hood over. Built-in oven. Built-in fridge. Exposed beams. Utility Area 1.88 x 1.77m Tiled floor. Wall mounted boiler. Hot water cylinder. Space and plumbing for washing machine. Electrics. Landing Window to north elevation. 2 radiators. Sloping ceiling. Telephone socket. En-Suite Bathroom 3.20 x 2.47m Velux window to south elevation. Tiled floor. Partly tiled walls. Heated towel rail. WC. Bath with mixer tap/shower fitment. Vanity unit. WC. Convector heater. Extractor. Bedroom 3 4.39 x 2.81m Window to north elevation. Radiator. Shower Room 2.10 x 1.68m Tiled floor. Partly tiled walls. Extractor. Shower. WC. Pedestal basin. Heated towel rail. Convector heater. Bedroom 4 4.12 x 2.78m Window to south elevation. Laminate flooring. Radiator. Dressing Room 3.38 x 2.00m Velux window to south elevation. Laminate flooring. En-Suite "Jack and Jill" Bathroom 4.80 x 2.54m Window to rear elevation. Tiled floor. Partly tiled walls. Extractor. WC. Bath with mixer tap/shower fitment. Heated towel rail. Twin vanity unit with mirror and light over. Convector heater. Door to landing. Attached Garage 4.81 x 4.78m Exposed stone wall. Hatch with drop down ladder to loft storage area. Space and plumbing for washing machine. Electric door. Window to east and partly glazed door and window to south elevations. Electrics. 5 bar gate give access to gravel parking and turning circle. "L" shaped Barn/hay barn 12.09 x 6.77m Concrete floor. New corrugated iron roof. Divided into 2 internal stables and storage. Rubber matting to stable floor. Hay Barn 14.00 x 4.34m. Attached Workshop 3.25 x 2.50m Power and light. Shed 3.25 x 2.45m Door to front elevation. Detached Stone and Slate Barn used as workshop. Open end store. 3 post and railed paddocks. Small lake with carp, roach and tench. Spring fed from Des Ormes. Fully enclosed dog proof garden. Separate Detached Gîte/Caretaker's cottage (Old bakery) constructed of stone under a slate roof with open plan Living Room/Dining Room/Kitchen on the ground floor. Bedroom with En-Suite on the first floor. Garden laid to lawn. Chicken coop. Mains water, telephone and electricity are connected. Drainage is to 2 all water septic tanks. Gas fired central heating, together with a Woodburner. Broadband internet is available. Security alarm system.